Good evening. Remember I'm Camey. I was just in here starting a night time fire for you and leaving a little bedtime snack. It's awfully cold out there and from what I hear, you've had a big day exploring. Why don't you put your feet up, relax and enjoy the goodies. But first, I'll join you for a little decaf. Shhh...don't tell Roxy Bloom I gave you decaf. It's just good to have to warm the bone and chit chat over. I dee-clare. . . who is crowdin' me while I get these mums in the ground. I swear y'all are tryin' to ruin my job as president of the Beautification Committee. Oh, Dear. I'm sorry. I am missss-taken. I though you was someone else. Let me introduce myself. I'm Low-retta Bebe. Oh, these old pearls. Mmm. . .a good southern gal never leaves the house without her pearls or lipstick. Honey, you could stand to use a swipe. But that's none of my business. I'm just here minding my own business. You know more than hair is being twisted down a the Honey Comb, cause I heard you've been all over Honey Springs and that you ate a little too much of Jean Hill's Fall Mix, is that right? Hmm..you look like you could stand to gain a couple. Anyways, I've got to get these mums planted before the big festival. I heard that Roxy Bloom rented a brides costume to dress up in. You know what, I'll tell you but I'd never tell her crazy Great Aunt Maxine Bloom. She's all sort of crazy if you know what I mean. Roxy is going to scare Patrick Cane off if she don't drag him to the alter soon. She claims she's not ready to tie the knot. . .but if you ask me, there's more eligible woman than Roxy Bloom around her. Don't get me wrong. She was good stock when she was a lawyer. But she turned them brains into beans. Coffee beans. Well, anyways. You better get along. 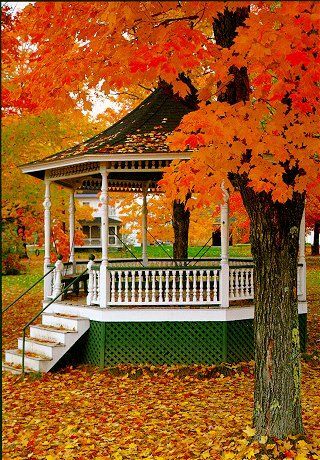 You can enjoy yourself here at the gazebo and enjoy the beautiful fall foliage. 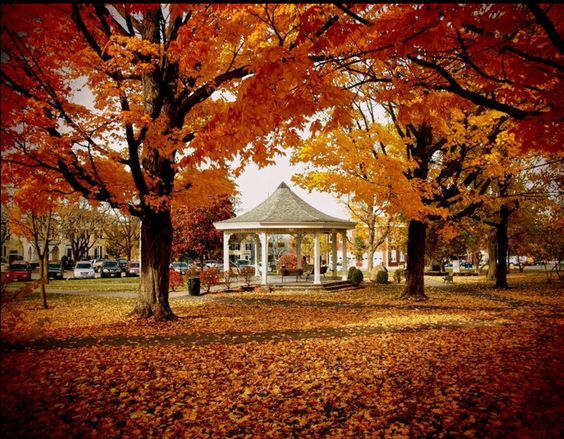 We just love how nature paints itself all over our little cozy town. Remember, you didn't hear about Roxy's costume from me. Or do you like to gossip? Because I'm just digging up some ground and I've got time to listen. Continue your virtual vacation by checking out the shops, the Bee Farm, downtown and more! Meets the characters in the Killer Coffee Mystery Series by clicking here . 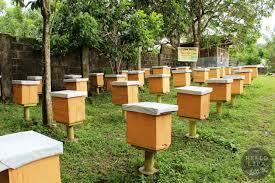 Welcome to the Bee Farm! I'm Kayla Noro. Me and my husband, Andrew, have been here a long time. We don't have no youngins' between us. These bees are our babies. I hope y'all had a great ferry ride over and Big Bib wasn't too much of a grump. He can be that way sometimes. Anyways, as you know, we are a little island off the main land of Honey Springs. We are a working. . .um. . .I'm sorry, I get a bit misty eyed when talking about the place. You see, I love this farm. I love all the bees. And as you walk around and take a tour, you'll notice a few of our bee houses are vacant. The upkeep of a house costs up to $400 each and sometimes these winter months do a number on them, though we do all we can to survive. I hate to bring it up, but if you like what you see, we are actually taking donations to help fund the Bee Farm. There's a jar inside of the gift shop next to the register. 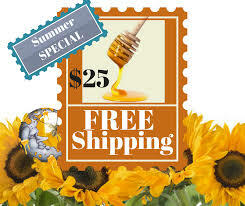 You know Christmas is coming, so if want to gift someone a jar of honey, we are doing free shipping. So buy several jars. If you see Andrew out there, he's probably fiddlin' with some bees. Stop by and say hello. He loves to answer questions. What is something you love to eat with honey in it? Continue your virtual vacation by checking out the shops, the Bee Farm, downtown and more! 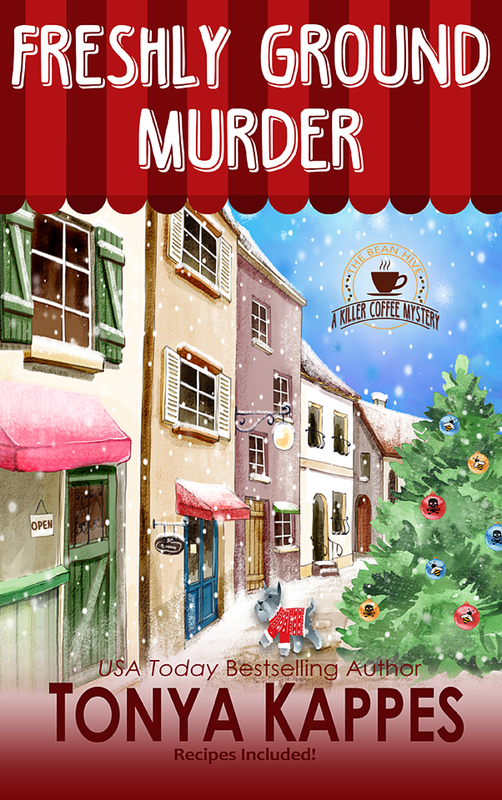 Meets the characters in the Killer Coffee Mystery Series by clicking here. Come on now. I don't have all day. I've got-a fishin' line to throw in. Ma'am, I'm sorry. It's gettin' late and I sometimes get a little ornery by the end of the day. I understand you're visitin' and all. I'm Big Bib. I own this here marina and as you can see we're tryin' to get all the boats winterized for the boatin' folks. Just pull your car on up, but don't drive off the front. I'll have you over to the Bee Farm in no time. What's that? Sorry the engine is a little rumbly. It used to purr like a kitten. The Bee Farm leaving? Well, I did hear some rumblin' about it. But you know I don't tell no tales unless it involves me. Though, I do know that Roxy Bloom has been drivin' herself nuts about somethin' goin' on around here. There was a couple of out of town highfalutin' fellars with some suits on that rode the ferry over earlier. But like I said, I keep to myself. 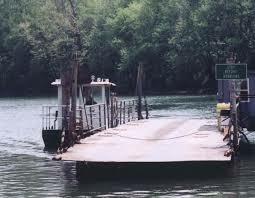 Have y'all ever ridin' on a car ferry before? We got them all over Kentucky. Hello! Welcome to Hill's Orchard. I'm Jean Hill. I hear y'all might be stopping by today. I'm busy getting ready for the hayrides for the Neewollah Festival. 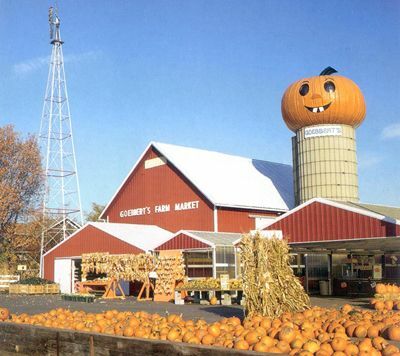 I'll be starting at the Cocoon Inn and using my horse drawn hay wagon to drive back here for the pumpkin patch. 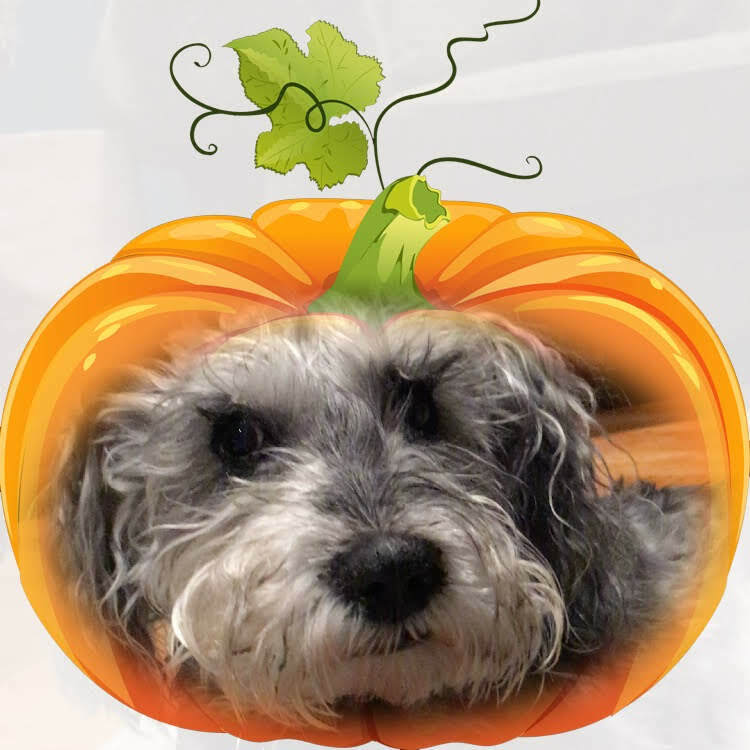 Why don't you gander on over to the pumpkin and get your photo taken? I'll just run inside and grab a snack for you! We back shortly. Y'all are still walking around? Oh, I hope you had fun! There's so many shops, it's hard to get through them all. I was just locking up for the night. I have to be here by 4:30 a.m. to get those treats in the oven. 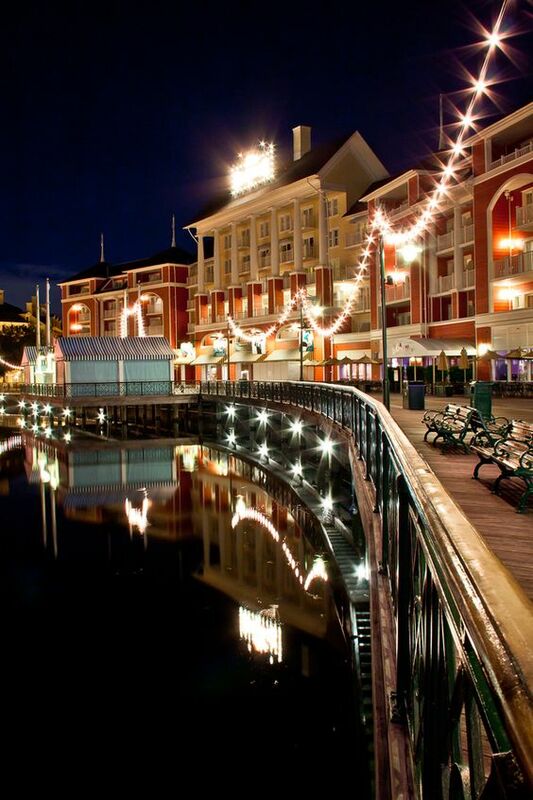 Don't you just the twinkling lights along the boardwalk? Those are provided by the Beautification Committee. 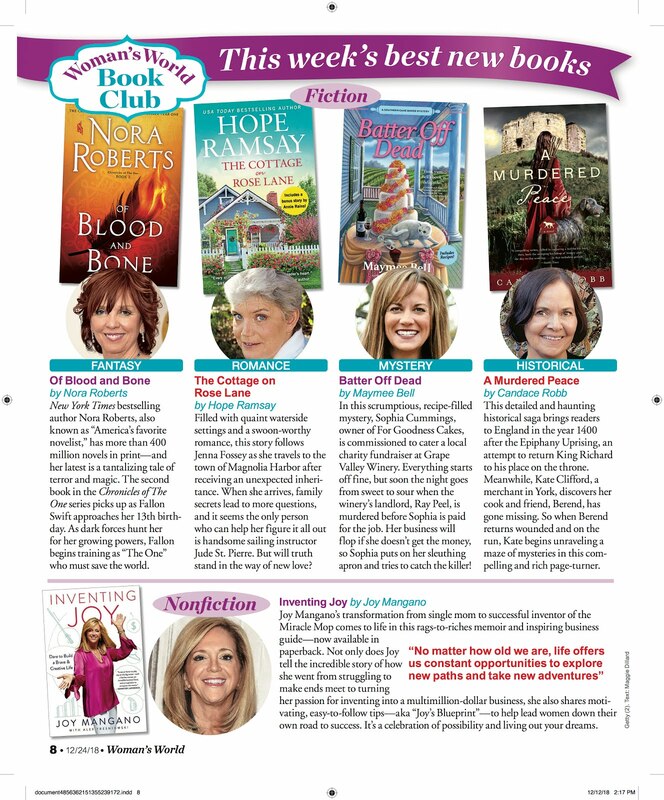 Have you met Loretta Bebe yet? Oh, you'd be sure if you did. I'm sure you'll see her downtown tomorrow. Didn't I hear you were going into downtown Honey Springs? 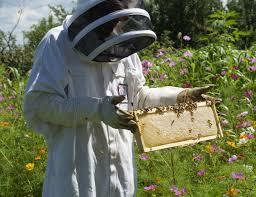 Don't miss out on going over to the Bee Farm across the lake while you're in town. You can catch the ferry down at the Marina. Tell Big Bib Roxy sent you. Hi-do! Welcome to Honey Springs. I'm Bunny Bowowski. I work at the Bean Hive for Roxy. I'm a tad bit on the older side rather than the sunny side of life, but working there in my 70's has been good for me. I do love me some good conversation. Which reminds me. I heard you're heading down to Crooked Cat Books. Mmmhmmm. Now Roxy finding Alexis Roarke murdered is just hearsay because I haven't really talked to her, but I heard it from Crissy down at the Honey Comb Salon. She'd know because she and Roxy were friends twelve years ago. It seems so long ago, but it ain't. Roxy hasn't been back to Honey Springs in twelve years, but the two of them, Crissy and Roxy, they picked up like no time had passed. You know, we do that in small towns. Oh, yeah. The police station. Anyways, Roxy's Aunt Maxi and Alexis Roarke really don't get along too well. Didn't get along, that is. In fact, they'd just had a public spat yesterday. Roxy went down to The Crooked Cat Book Store, Alexis's store, to offer what I'd call a peace offering in the form of a cup of coffee and doughnut. This is where is gets good. Alexis. Dead. Murdered. Not only that, but BANNED was stamped on her forehead. You know, Alexis used that stamp on the banned books in The Crooked Cats' banned book section. Mmmhhhhmmm. Now that's just hearsay. Though I do know that Roxy is down at the police station trying to get her Aunt Maxi out of some kind of hot water. After all, just a few months ago before Roxy moved back to Honey Springs, she was one of them fancy lawyers. Mmmhmmmm. Nothin' like this has happened in Honey Springs. . .ever. Now, you come on back. Remember that around these parts, the gossip is just as hot as the coffee. Toodles! Good morning! I heard you were in town. I'm so sorry! Where are my manners? I'm Emily Rich and I own the Bee's Knees Bakery. If it weren't for Roxy Bloom over at the Bean Hive Coffeehouse, I'd probably still be in college hating it! My, that sounded awful...didn't it? I mean, I was miserable going to college. I worked for Roxy while I was in high school and I loved baking. My heart is right back there in that kitchen making all sorts of delicious goodies for the good people in Honey Springs. Roxy had talked my dad, Evan Rich~he's the president at the bank. Anyways, Roxy stuck her neck out on the line and told my dad that I wanted to be a pastry chef. You couldn't imagine my surprise when he accepted the fact that I'd dropped out of college to go to pastry school abroad. How did I get my shop?? Well, it use to be a tattoo shop called Odd Ink. I'll let you something but you can't breathe a word of it. Get closer, I don't want anyone to hear because gossip spreads like melted butter on a hot biscuit around here and I'm not gossiping. The owner, he was murdered. It was almost a year ago Christmas. True story. He wasn't murdered here in the shop. He was found under the town square Christmas tree during the Honey Springs Annual Tree Lighting. But all that's over and done with. Roxy's husband, Patrick Cane, he owns this building and they rent it out to me. So it all worked out. 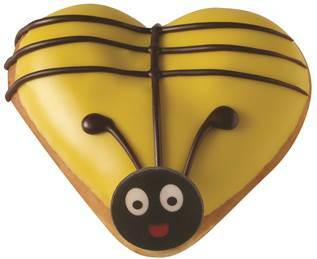 I hear you're headed to the Bee Farm, Hills Orchard and downtown today. 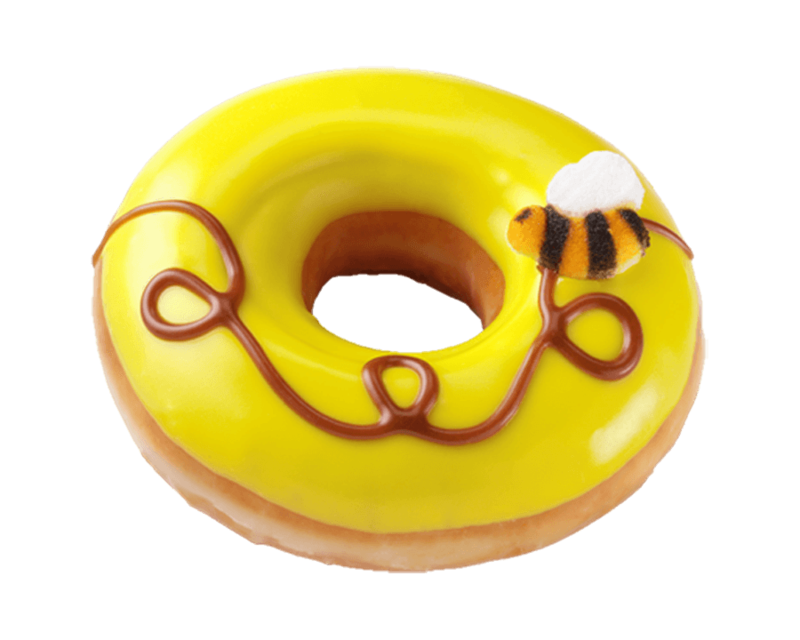 Say, you keep eyeballing my bee donuts. 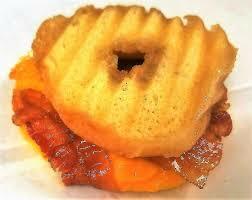 That right there is a bacon and egg donut sandwich. Which one would you like before I let you get on with your day? You're gonna need your energy for all those places your going. Hi there! Welcome to the Cocoon Inn. I'm Camey Montgomery, the owner of the Inn and I'm thrilled you've decided to lay your head here while you visit our little lake town of Honey Springs. Don't mind all dirt piles around the Inn. I've got my landscaper planting mums around the property so we are all ready for the festival. Your room is ready. It's one of the suites that has it's own balcony facing Lake Honey Springs. You're going to love sitting out there in the rocking chair with one of our quilts and a complimentary cup of coffee and sweet treat from Roxy over at the Bean Hive. Oh...you met Roxy. Isn't she great! When you get up in the morning, you can come on down here and right over yonder in that room is the hospitality room where you can get a coffee and pastry from the Bean Hive. Help yourself to get some and take them back up to your suite. You won't be disappointed with the amazing fall foliage you're going to see along the view of the lake from your suite. I hope you'll think about staying for the Neewollah Festival. The main night is going to be on the bank of Lake Honey Springs in front of the Inn, right down there. If you need a costume, you can go over to All About the Details. I think they've got some left in your size. But you can head on up stairs to your room. I'm sure you're exhausted from your travels into town. Plus I hear you're taking in all the shops on the boardwalk tomorrow. You're gonna need a good nights sleep. 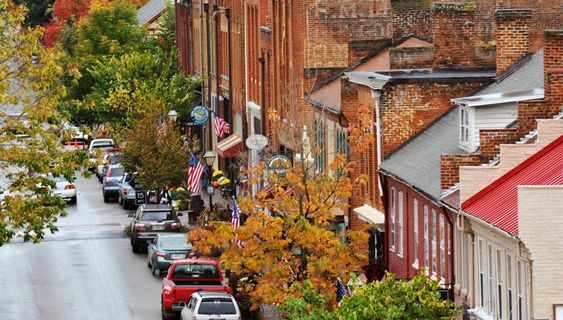 Continue your virtual vacation by checking out the shops, the Bee Farm, downtown and more! Meets the characters in the Killer Coffee Mystery Series by clicking here to continue the vacation. I'm cute, right? Women love mustaches. I've been told that salt and pepper hair is a sign of maturity and some women like it. As a bonus, my hair is nice and soft, not wiry like some of my kind. Hey, here comes someone to look at us. The lady who takes care of all of us is doing that slow walk next to all our cages. That means the woman with her might just take me home. Boy, would that be nice. 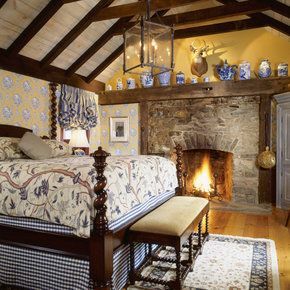 I'd love to sleep in one of those beds and be able to run around again. Not that they don't take care of us here, but I have to share. Yip! Yip! Grrr...I have to stop that jumping up. It's like my paws have their own mind. They spring up when I get excited. Stop jumping. Stop jumping. Well, at least stop jumping until we can get a home, I have to remind my paws. Then we can jump all we want. Come on down here. 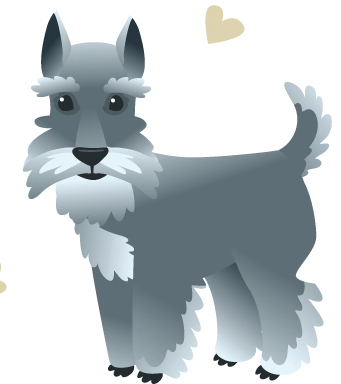 You are obviously in the market for an adorable grey haired Schnauzer, I yipped louder when I saw that she'd stop down at the poodle cage. Poodle, smoodle. Come see me! I'm much happier and less maintenance. I mean, I do like to be bathed and groomed, not to mention rubbed on. Not that poodle! She's trouble with a big T.
"I don't know," the woman said. "I do want the company and it'd be fun to have companion at the Bean Hive with me." Retreat. Retreat. My paws don't seem to be listening, they kept jumping. She said bees. Retreat! Umm...maybe not the owner for me. I'm definitely not fond of the bee insect. Once, I'd gotten in a little scuffle with a few of them and I think they won after they made my lip swell up bigger than my head. I couldn't eat and I love to eat. I got a shot from the veterinarian and that did hurt. "You own the Bean Hive Coffee Shop?" My caregiver asked the woman. They were still walking my way. "I do." She has a sweet smile. Her eyes are kind. But I don't like bees. "I heard you have the best coffee. The name of your shop, The Bean Hive, is adorable." My caregiver walked down the center aisle. The woman nodded and looked in the cages before me. The Bean Hive. I yipped and jumped around. Not the bee hive. Shoowee, that was a relief. "Why do you want a dog?" My caregiver always asks this question. "I'm single. I just moved here and opened the shop. 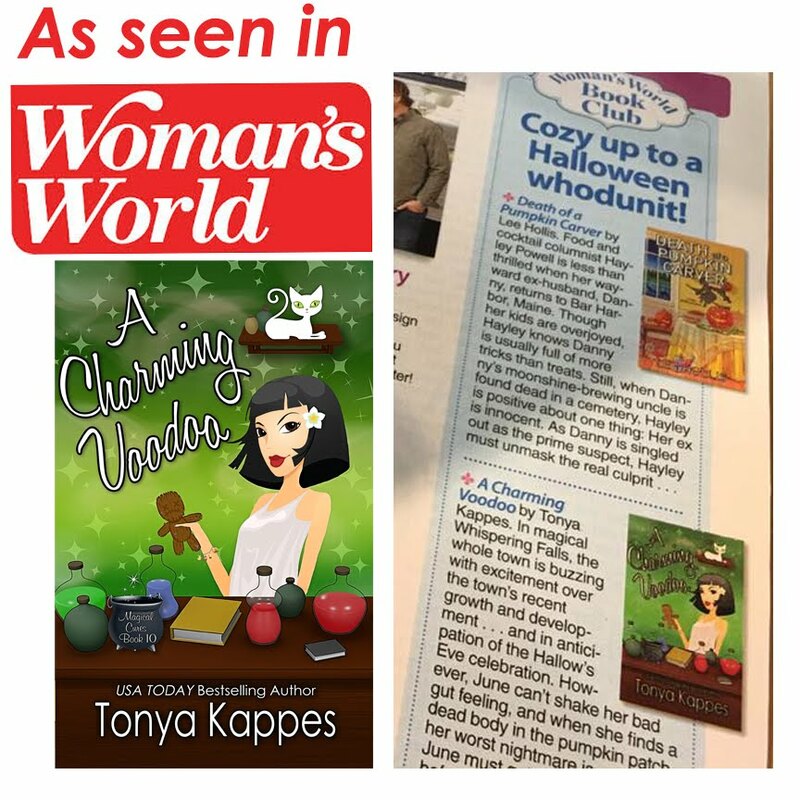 I'd like to have a companion that will alert me of customers if I'm in the kitchen of the shop or even if someone comes lurking around my cabin." The woman lovely voice perked up my ears. Single? Did you say single? I yipped. Don't get me wrong, if I had to live in a house with kids or other animals, I'd chew on my rawhide and make the most of it. Hey! Hey! So I have a loud yip. What's wrong with that? See! I can protect you with this bark! Sit, sit, sit. Thankfully my hinny listened. My little nubby tail wouldn't stop wagging back and forth. What's wrong with my head? It keeps moving left and right. Wait. Now what is wrong with my tongue. I questioned my body's reaction when the woman stopped at my cage. It was like I'd been possessed. "Is this a Schnauzer?" She asked. I looked back at my tail in fear it was going to wag right off of me. "I heard they bark a lot." Tongue in. Don't bark. Don't jump. "He's a good dog. His last owner moved overseas in the military. He's been here a while. Not many people are adopting these days." My caregiver always said this. "Really? 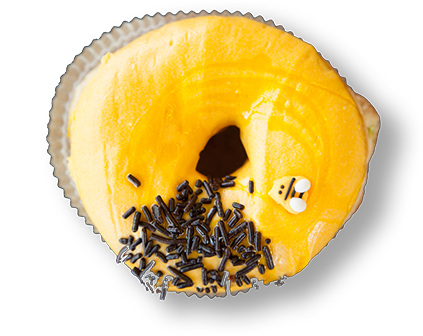 Maybe we can do a fundraiser or adoption party between the SPCA and The Bean Hive?" The lady seems nice. "Whoa, he can jump." The woman laughed. "What's his name?" "Pepper." My caregiver is a nice lady but this woman seems to think I'm cute. "He's sweet. Would you like to see him?" "I would." The lady backs away. You want to see me? Stop it! Stop jumping. Tongue, back in my mouth. Stop wagging. What is wrong with my body? It's not listening to me! Oh....you smell like food. You smell yummy. My nose smelled her shoes, her pants. You smell like heaven. "Oh, my. He's a snuggler." The lady giggled the cutest giggle I've ever heard. "You want to try him out?" My caregiver said that about other dogs but never me. Try me out! Try me out! I danced around her feet. "Pepper, you want to come home with me?" The lady couldn't get it out fast enough. I jumped right up in her arms before she could change her mind. Do you have a pet? If so, how did you get your pet? Breeder? Pet store? SPCA? If not, no worries! Just tell me what type of animal you like! Leave a comment! 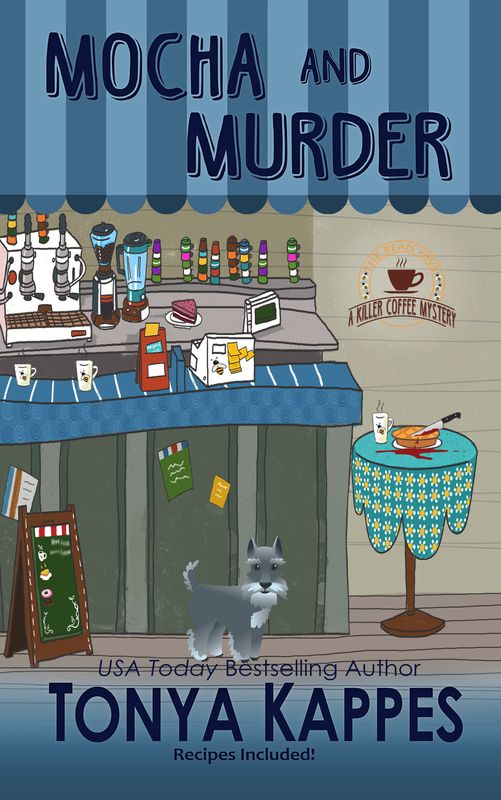 You can check out Pepper and the rest of the gang in the new Killer Coffee Mystery Series! 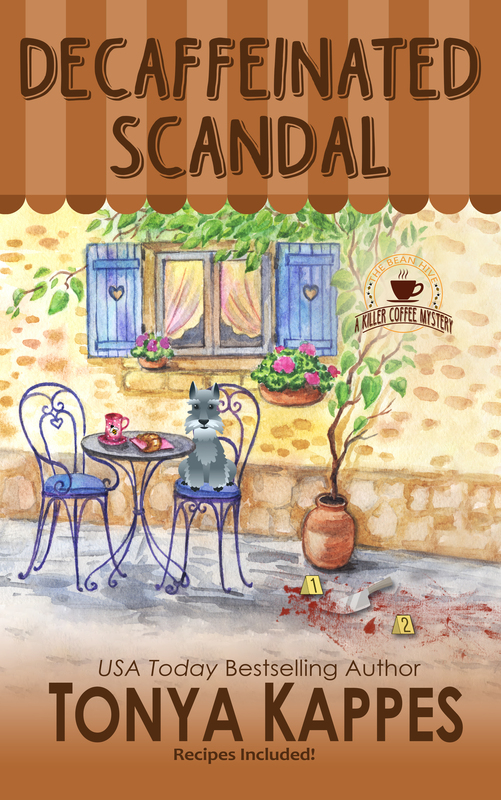 Order your copy of Scene of the Grind, the first book in a new coffee mystery, A KILLER COFFEE MYSTERY SERIES. After a bitter divorce, Roxanne Davis (her friends, though few call her Roxie) has moved back home to Honey Springs, Kentucky where she's opened the tourist lakefront town's first coffee house, The Bean Hive. 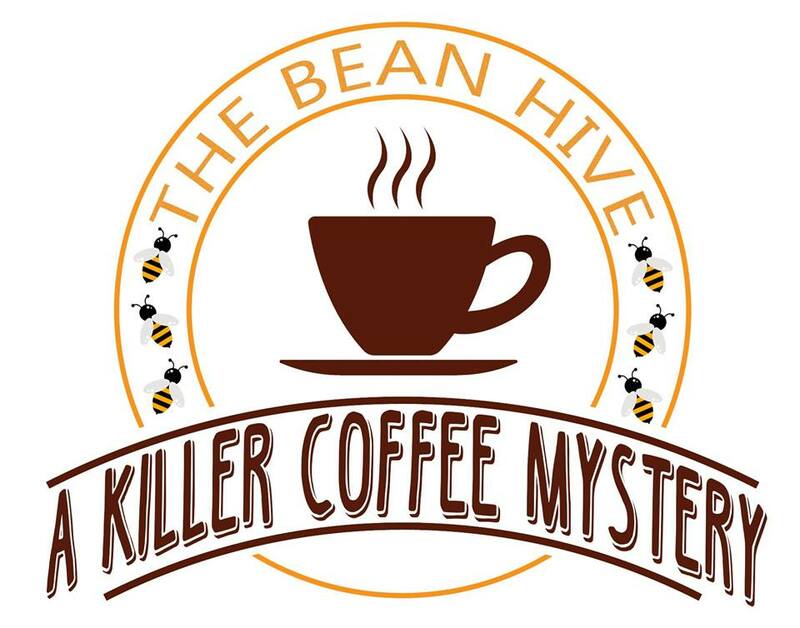 With the excitement of the Bean Hive opening and rush of business, Roxie is moving on with her life until she finds that one of her best customers, Lilia Walters, was found dead after eating one of Roxie's best-selling doughnuts after Roxie's aunt Maxine gave Lilia as a peace offering. 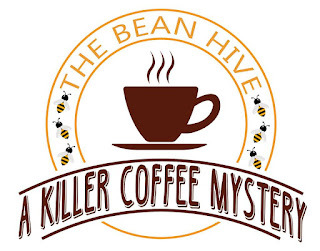 Gossip in Honey Springs is as hot at the coffee served at the Bean Hive and Roxie has to uncover who is behind the murder not only to save her shop, her aunt, but her life.